The ADDIE model is commonly used to produce training. 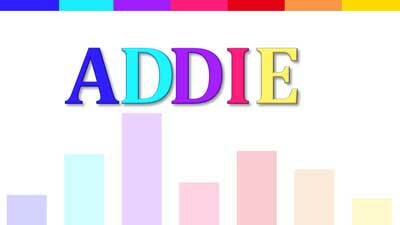 I follow the ADDIE model with a few tweaks. When developing eLearning − when the final product is more like a software package than a set of materials − it’s critical to take an iterative approach. Let’s start at the beginning. A is for analysis. Most clients have already done some of this: they know who they need to train and what they need to learn or do. But fresh eyes are often good; I like to make sure my clients aren’t training a skill to improve performance when the lack of skill isn’t the problem. (Staff not entering their time? Maybe computer access is the problem.) The analysis of audiences and tasks makes sure the training will improve performance and achieve a business goal. D and D is for Design and Development. These steps dance with one another. A little design two-step this way, then a bit of development − maybe a prototype − a dip that way. Design and Development are not independent, but are flexible and iterative. I is for Implementation. This is where eLearning really shines! There are no classrooms to book, no trainers to schedule (unless it’s a blended, synchronous approach), no registrations, no vacations to schedule around. Learners access the material online, when they want it. There’s often some extra testing that needs to happen when the learning module is published in a learning management system (LMS) but I’ll take that over classroom training! E is for evaluation. Because I’m a contractor, I’m often not around to perform a months-later evaluation but I can set you up with one if you want. The biggest hurdle to evaluation is knowing what to measure and measuring a baseline before training begins. (How many people enter their time accurately now? How many mistakes are made now? How many mistakes are made after training?) These metrics can demonstrate a clear return on investment for the training program.